Nearly seven years ago, Nancy was diagnosed with breast cancer. It was found thanks to a mammogram technician who “worked until she found it.” That moment put her on a path to survival. Early detection, diagnosis and treatment saved her life. Nancy found that support at Methodist Estabrook Cancer Center in the doctors, nurses and staff she visited with during every treatment. She also found support in her husband, Alan, who was by her side every step of the way. Methodist Estabrook Cancer Center is like family. Everybody can connect to what’s going on with you – how you’re feeling, what you’ve been through. Support is so important. Ever month, the Stahls not only visit with the providers who saved her life, they deliver pins and small patches to the survivors still going through treatment. It lets those survivors know they are not alone, and that there is hope in a cancer-free tomorrow. Nancy says cancer “changes your life forever.” Things which were important before are no longer. She says her family and kids are everything. 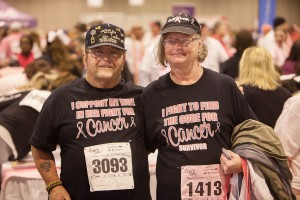 Nancy and her husband fight for a cure together and each year participate in the Susan G. Komen Nebraska Race for the Cure.